Very little is known about Roy Brown, and very little documentation has survived. Even the photo taken of him in prison camp is incorrectly labelled as ‘Reg Brown’. (York Army Museum). Fortunately his POW records are more forthcoming. (Prisoners of the First World War). Roy was born in Knaresborough on 3rd May 1895 so when the war started he was 19, and he obviously wasted no time in volunteering, having the number 106, meaning that he joined possibly on the first day of recruiting. On the list of volunteers his address is given as 2 Seaforth Avenue, Harehills, the same as was given on his POW forms in 1917 for his mother. This address was confirmed by the 1918 Absent Voters List, which also showed William and Emma Brown at the same address. (Leeds City Library) It was now possible to find them on the census. Having joined Roy was posted to D Company, but no specific job is indicated. He would presumably have gone to Colsterdale for his training, then Ripon and Fovant, before sailing for Egypt. His Medal Card shows that he landed on 6th December 1915. (Ancestry). In March the battalion sailed back to France to be ready for the Big Push. As a private Roy would get little or no specific mention in the records. We don’t know if he took part in the 1st July attack on the Somme, but there’s no reason to suppose that he didn’t. He was certainly part of the Pals’ attack on 3rd May 1917 during the Battle of Arras, because he was captured, unwounded, at Gavrelle. Initially he was moved round from one camp to another, being in Dülmen on 23rd June, Burgsteinfurt on 16th July, Limburg on 11th August and Münster on 8th November 1917. There he appears to have stayed, for the next twelve months, until the war ended. He must have been released and repatriated fairly quickly as he was back in England to be transferred to the Reserves on 13th March 1919. He was subsequently awarded the 1915 Star, for his service in Egypt, the British War Medal and the Victory Medal. (Ancestry). Herbert Bower – an early American entry? Thomas Bower was married to Sarah, possibly Sarah Ann Bibbing, possibly in Barnsley in 1883. (Free BMD). In 1892 they had a son, Herbert, born in the USA, and another son Thomas, also born there, in 1895. According to the 1911 Census they had three children, one of whom had died, which might account for the gap between their marriage and Herbert’s birth. What took them to the USA is not known, but what few records there are for Herbert all confirm his American birth, with the place variously given as Boardington, which may be a misunderstanding of Bordentown, and Philadelphia, which is some thirty miles away. (Find my Past). They did not stay long, for on the 1901 Census they are shown as living at 31 Bristol Street, Leeds, but without Thomas the father. He may have remained in the USA but it seems more likely that he had died, since he is given as ‘deceased’ on Herbert’s marriage certificate in 1914, when Herbert married Hettie Berry, and possibly moved to 17 Marion Avenue, Woodhouse, Leeds. (Find my Past). Before this, however, the family had moved to 30 Clay Pit Lane, Camp Road, Leeds, where they appear on the 1911 Census, both brothers being given as tailor’s cutters. Whether there was any connection with the Camp Road Baptist Chapel I don’t know, but if there was this would also provide a link to the Pals, as the former minister of the chapel, Rev. E A Cartwright, had joined in 1914. (Laurie Milner ‘Leeds Pals’). Herbert, however, did not join until December 1915, and according to his Medal Card was not attested until April the following year, hence his late service number. This may be because he was a married man, with two children, one born shortly after the wedding, and the other, Alan, on the day following Herbert’s attestation. (Ancestry). Joining when he did, Herbert would have finished his training and then gone straight to France, too late for the Battle of the Somme. He was, though, in time for the Battle of Arras, which for the Pals began on 3rd May 1917, and on that day Herbert was reported missing. It was subsequently confirmed that he was a prisoner, having been wounded at Gavrielle in his right arm, right heel and back. 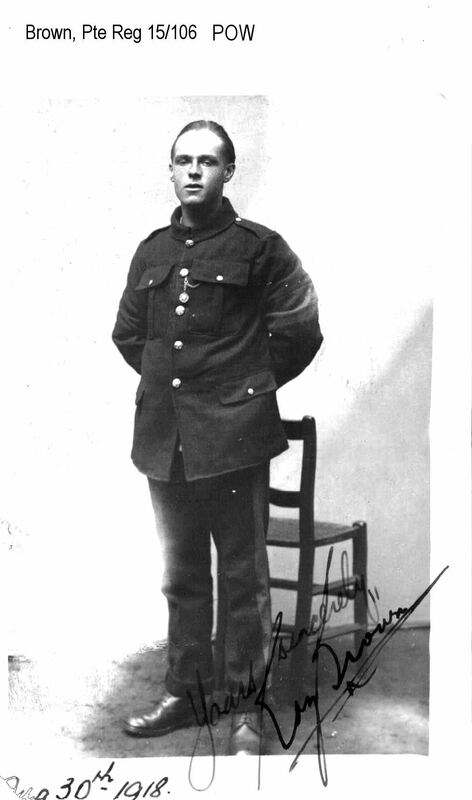 On 2nd August he was recorded at Cassell POW Camp, where he appears to have stayed until the armistice. (Prisoners of the First World War). On his return to England he was discharged as wounded in April 1919, awarded a pension of 9/- a week, for one year, a Silver War Badge, and ultimately the British War and Victory Medals. Fred Bates was the first son and third child to be born to William Bates, an oat cake baker who had married Alice Ann Greaves in Leeds in 1871. (Free BMD). Fred was born on 12th August 1878, after two girls, Frances and Annie, and before another boy, Roden, also spelt Rhoden, and a third girl, Nellie. Roden is possibly the same person who spelt his name Rawden on the 1911 Census, when he was living in Liversedge. (Find My Past). Certainly a Rhoden Bates married Louisa Weldrake in November 1901, which fits with the 1911 Census record, and one of the witnesses was Rawden Weldrake, perhaps her brother, as her father, like Rhoden’s, was dead. (Find My Past). Fred was born in Hightown, Halifax, and three years later the census had the family address as Harts Moor Road, Clifton, Halifax. On the 1891 Census the address is given as Hartshead Moor, Clifton. Alice was by now a widow, and it is possible that William died in 1883, in which case he was only 32. On the 1901 Census Alice had remarried, and become Mrs James Lawford, and they were living at Hare Park, Liversedge. Fred is given as a leather currier, but by 1911 he is a drapery dealer. The Lawfords were still there in 1911, but Fred had moved out, probably because in March 1906, in Dewsbury, he had married Ann Frances E Naylor, and they were living at Clough Lane Top, Liversedge. In May of that same year they had a daughter, Marion, and another daughter, Millicent, was born in 1910. Fred, Ann and Marion were still living together in 1939, at 500 Halifax Road, Spenborough. Millicent, presumably, had got married. (Find My Past). Fred’s service record has not survived apart from his medal card, so we don’t know when he enlisted, but his number suggests that he joined after September 1916, unless he was transferred in from another regiment. (Ancestry). As an older man, married with children, he would have been called up later anyway. What have survived are his POW records, which show him as a member of C Company. He was captured, unwounded, at Oppy on 3rd May 1917, during the Third Battle of Arras. (Prisoners of the First World War). This was quite a lengthy battle and included a number of different actions, the most notable of which was probably the capture of Vimy Ridge by the Canadians. That part was over when the Pals joined in on 3rd May, the first day of the Third Battle of the Scarpe. No significant advances were made, but Bert was captured, and for the second time the battalion suffered very heavy casualties. Estimates vary but the Pals were probably reduced to about a third of their number. On 23rd June Bert was at Dülmen Camp, on 28th July at Limburg, and on 23rd January 1918 at Güstrow, where he presumably stayed for the rest of his captivity. The Germans were keen to photograph their prisoners, to show that they were being well-treated, and Bert was one such. Ten months later the war ended and Bert was repatriated. 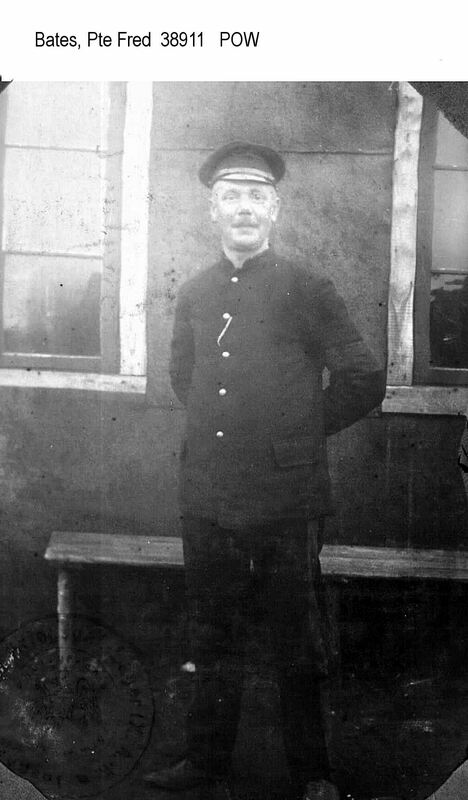 Bert was discharged from the army on 29th March 1919. He was awarded the British War Medal and the Victory Medal. He did not get the 1915 Star, which supports the idea of a later enlistment. As already mentioned he and Ann, with Marion, were living in Spenborough in 1939. It is possible that he died in 1959, in which case he would have been 80.
and previously Private 978, 6th Battalion Duke of Wellington’s Regiment. Fred was born in the first quarter of 1885, the sixth of the seven sons of William and Leah Chadwick. In the 1891 census the household also included three daughters and William’s widowed 80 year old mother-in-law, Sarah Rawnsley. The siblings were Alice, Sarah, George, Hannah, Thomas, Frank, Charles, William and Ernest. The older ones were employed either in boot and shoe manufacturing or woollen mills. William was a night watchman. (1891 Census Find My Past). By 1901 the family was still living at 110 Birks, Guiseley, as in 1891, but Fred had left home and was working as one of a number of gardeners employed by Frank Atkinson at Cresswell Hall, Bedlington, Northumberland. (1901 Census, Find My Past). By 1911 Fred, who had married Florrie Mallinson in 1908, (Free BMD), had returned to Guiseley where he was working in an iron foundry (Sykes and Shaw Gilroyd, Iron Foundry, Guiseley) and Florrie as a machinist for a boot manufacturer. They were living at 31 Otley Road, Guiseley (Army Service Records, Find My Past). They had a son, Ben, born in 1912, who died in 1914, (Free BMD), and a son Fred, born in 1916, whose name appears with his mother on the In Memoriam for his father published in 1919. However, the mother’s name is Mary, as also given as Next of Kin on the Army Register of Effects. There was a marriage between Fred Chadwick and Mary Griffin in Leeds, in June 1915, but I have found no indication of what became of Florrie. At some point between 1901 and 1908, when Fred married, William had died, possibly in 1906. In 1910 Ernest married Elsie Wilson, and on the 1911 Census they were living at 118 Otley Road, Guiseley, along with Leah Chadwick, now a widow, but determinedly the head of that household. Fred joined the 6th Battalion of the Duke of Wellington’s West Riding Territorials a few days after his brother Ernest in December 1908. Fred’s service number was 978 and Ernest’s 973. The medical inspection report for Fred says that he was 5 foot 6 inches tall and had a chest measurement of 34 inches. His physical development was “good”. Gardening and working in a foundry probably accounted for that. 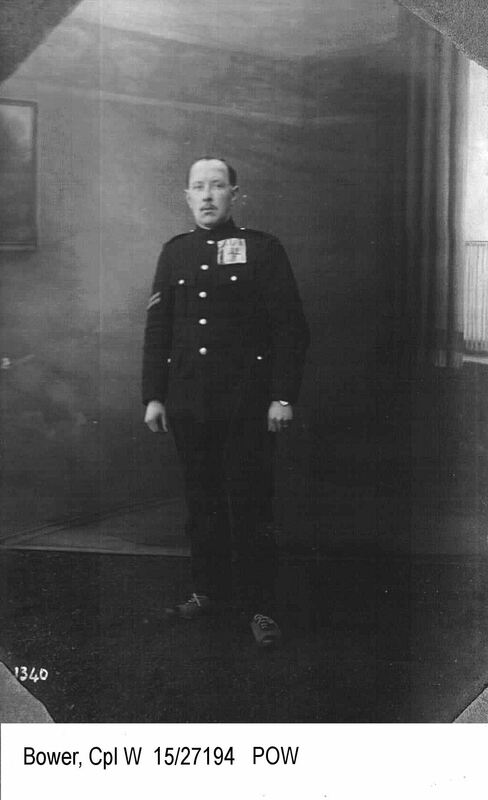 The officer accepting him was Captain Wilfred Claughton, a member of the Claughton family who owned the boot and shoe factory in Otley Road, Guiseley, and who no doubt employed several members of the Chadwick family. No individual service record of Fred’s time in the Pals survives. The medal roll records that he qualified for the British War Medal and the Victory Medal. As he did not qualify for the 1914-15 Star for Services Overseas before 31st December 1915 he could not have gone abroad until after January 1916. His regimental number indicates that he was not amongst the original 15th Battalion -the Leeds Pals- but was part of a draft of reinforcements in 1916 or 1917, but not before September 1916, when all new men were given new five-digit numbers on a regimental basis. The 15th Battalion was fighting in the Arras offensive on 3rd to 4th of May 1917, and Fred Chadwick was presumed dead on or after 3rd of May (Army Register of Soldiers effects.). He has no marked grave and is commemorated on the Arras Memorial. On 3rd May 1919 two entries appeared in the Yorkshire Evening Post In Memoriam columns, one from Fred’s wife and son Fred, the other from the family. Researcher: Jane Luxton with information from Margaret Dale, Fred’s great-niece.